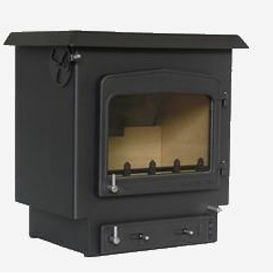 Traditional stove available in black or coloured finishes. With or without back boiler. Fantastic Stove – so pleased. Stove expert replied: Lovely review, good comments for this manufacturer. Top thin metal that bows downwards. Top chimney closure leaks. Never able to use the griddle function as it always blocks with very poor design. Stove expert replied: Great review, the heart of the home! Stove expert replied: Good to hear you have a pipe thermometer, always useful to insure correct operation of a stove.